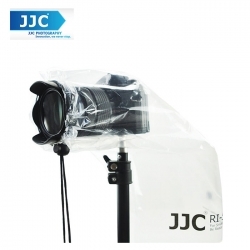 JJC RI-S Camera Rain Cover is designed to protect your camera from rain, dust and mud effectively when you shoot in rainy days. The cover is suitable for DSLR with a lens up to 11" (28cm). It is made of PE material and is totally see-through, which gives you complete access to your DSLR's controls and viewfinder. What's more, the rain cover mounts on a camera easily. Just pull the lens sleeve drawstring properly, and it will fit your lens closely. It also allows you to attach your camera on a tripod. With the cover on, you can still use a lens hood. Besides, the cover is lightweight and easy to carry. With JJC RI-S camera rain cover, you will feel relaxed when shooting in rainy days. JJC RI-S Rain Cover will accommodate a DSLR with a lens up to 11" (28cm) long and 7" (17cm) wide. The cover is specially suitable for DSLRs with prime lens and mirrorless cameras.